The LG V35 ThinQ may be the harbinger of the V40 ThinQ to be released October 3 in terms of overall looks, but not so much in specs. LG's project "Storm," the V40, will be its fourth flagship for the year, turning it into a Sony of sorts, but on steroids. First, there was the V30S, which started the whole ThinQ thingy, and enriched the V30 with AI shenanigans, then came the G7 ThinQ, then the V35 ThinQ, so let's preview the next ThinQ. Thankfully, on the V35 LG didn't run with the wildly-annoying notch trend it went with on the G7, but leaked V40 renders show that it will a have protruding bezel, encroaching into the sacred screen panel space. Those same bezels will be kept to a minimum, though, says LG, and the V40 will be one of the lightesst, most compact phones with 6"+ displays, it claims. The V35 is already one very, very compact phone for its display size, and we'd like to keep the line this way indeed. An IP68-rated water-resistant glass body can be reasonably expected, but LG already hinted that it will keep its V-line "more innovative" in the future, so we wouldn't rule out design surprises, just hope that they aren't of the modular, snap-on type. Yes, LG went there with the G5. What LG hinted at when it spoke about the V40 design, is "dotted" glass rear in three colors - Aurora Black, Platinum Gray and Moroccan Blue - that will make gripping traction better, while at the same time remaining durable and allowing wireless charging current to pass through. The proprietary tech is called Silky Blast by LG, and is a "treatment to etch microscopic pits on the rear glass of the LG V40." Hopefully, the matching cases you will inevitably slip on the phone, will be as nice to the touch as the Blast treatment. In the runup to the G7 ThinQ launch event we went to in New York City, LG explained that it opted for an LCD panel in its latest flagship because G-series devices are considered more mainstream by the company. In fact, LG appears to be positioning the G7 as a more entry-level flagship, although it said that pricing of the panel wasn’t the chief factor for the decision. Instead, the company’s use of LCD stemmed from its plans for future V-line smartphones. 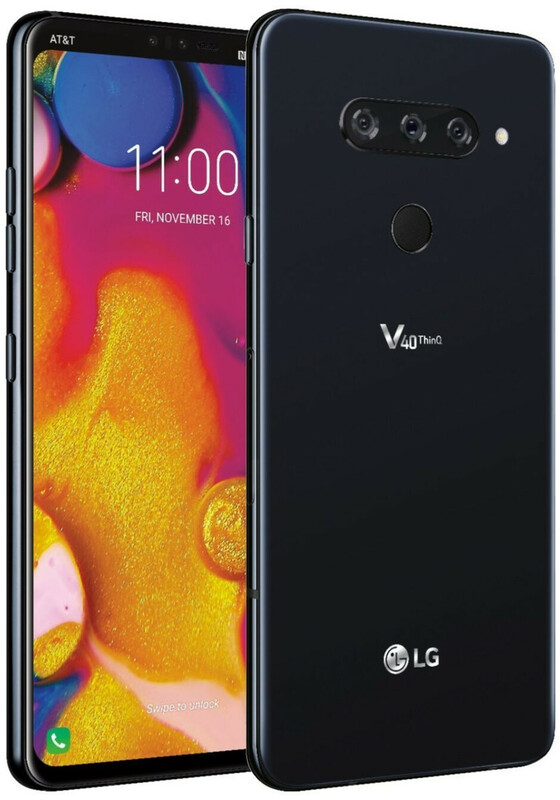 Last year’s LG V30 introduced a new OLED panel, the V35 follows suit, and it appears LG has similar plans for the fall’s LG V40, with the South Korean brand confirming that it is saving its OLED panel production for future V-series devices. As far as size or resolution, it will be "with a display measuring greater than six inches," so LG isn't bucking the trend here. The latest rumors peg a 6.4-inch notched display carrying a 1440 x 3120 resolution. That works out to an aspect ratio of 19.5:9, and will probably take a large toll on the battery due to the QHD+ resolution. While a Snapdragon 845 chipset, and 6GB RAM seem to be almost certain for an eventual V40, given that it will likely be the last flagship for the year from LG, and will have to go against Samsung's Note 9, plus Apple's iPhone XS Max, LG likely won't skimp on the internal storage in this thing, so 128/256GB models are entirely plausible. We are certainly inclined to ask for a larger battery than the 3300 mAh pack that powers the V35, as the high-res display, coupled with a powerful chipset, is likely to kill the capacity in no time, unless LG pulls a Note 9 (at least as far as rumors are concerned), and intro's a battery closer to the 4000 mAh mark, then to the 3000 mAh one. 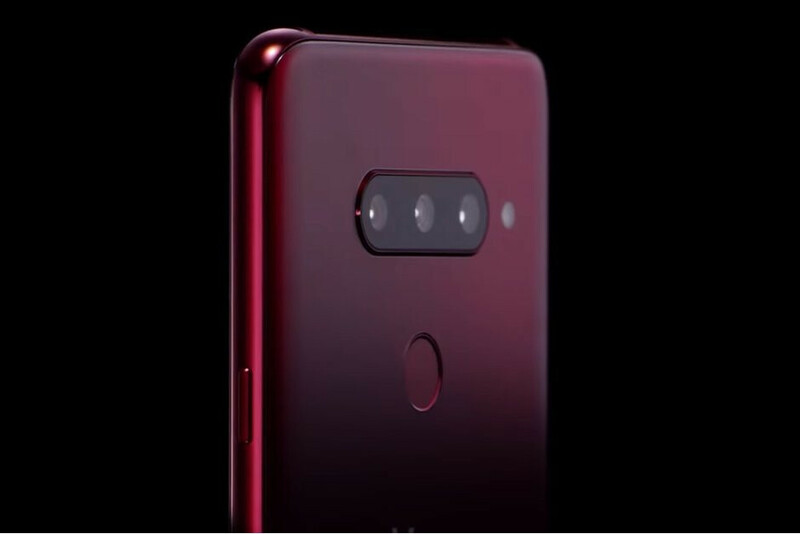 What would a reported V40 ThinQ do in the camera department that LG hasn't already done in one form or another? It's had dual-cam flagships for a while now, and is even unique in offering wide-angle secondary lens, instead of the usual depth sensor or telephoto lens that most others are now equipped with. It also was the first with triple-focusing tech by introducing laser AF, in addition to the usual shenanigans. Well, LG will jump on the triple camera bandwagon that was started by the Huawei P20 Pro, but is now carried over by Samsung with the A7 (2018), and rumored for the Galaxy S10. The three cameras are mounted horizontally, and the camera on the right features a 16MP sensor that takes "Standard" pictures. The 12MP middle camera produces "Super-Wide Angle" shots, and the camera on left has an 8MP "Telephoto" lens. In front, we expect to see an 8MP camera for "Standard" selfies, and a second camera that delivers "Wide-Angle" images. A triple cam setup with wide angle plus telephoto lens would be the dream mobile snapping kit, so, thank you, LG. The V40's announcement is set for Wednesday, October 3, but as far as the release date, the phone will likely be launched a week or few after. The pricing is actually less murky - given that the G7 ThinQ landed at $750, the V35 at $900, but was quickly BOGO'ed afterwards, we expect nothing less than $900, and perhaps a bit more, for LG's finest for 2018. What do you think? Just another Android flagship. Maybe one of the better ones, I don't know. There are simply too many Android phones out there and all of them are more or less exchangeable to the other phones in their respective segment. Thank god I decided to go back to iOS where at least I know I don't serve a data kraken named Google and where I know a company values me by delivering software support for 4 to 5 years. All you get is version number update. Not the features. Don't be excited. It's so interesting to see a person who values a lack of options and preferences in buying. Do you own all the same colour of shirts and slacks? There is no true difference between Android flagships. Difference exists between iOS and Android but not really within Android. All Android OEMs buy the same hardware. All of them use the same OS. They differ by icons and skins for Android.... wow I am so impressed. That's not even close to true. I understand that an IOS used wouldn't understand the differences, so let me lay them out for u. 1. Design: Do you realize that there are droids out there with HUGE designs differences? For example. The Meizu pro has a second display on the back of the phone used for any innovative purposes. Look it up. Or how about the devices made by Asus ROG with RGB lighting? They look tough and ruggud with grooves and angles that make it look like a little gaming PC. Look it up. 2. Storage: Not all androids are the same, and neither are it's users. Some users don't require much storage, so a simple 128 or 256GB is sufficient. That's the philosophy of some android devs and IOS as well, but other android devices allow us to pop in a 512GB SD card. One which I have and what LG allows. Not all android manufacturers allow external storage at all. But a guy like me NEEDS that storage. I have 317GB filled already. 3. Features: Did you know that some android devices are equipped with IR blasters? Do u know what that is? Think of a remote controller for TV. The little glass eye on the front of the remote that let's it change the TV? Thats an infrared sensor that some android devices (no IOS has) that allows u to change any TV, cable box, or other remote controlled devices. If you don't know about LG V series cameras compared to the rest of the market, then educate yourself. The difference is vast. There are other things I could argue here, but I'm sure it would mean nothing to and IOS fanboy. Here is a fact. No tech enthusiast in the country owns and Iphone. Not all android owners are tech enthusiasts, but if you are a tech geek who understands technology, u won't grab an IOS or MacBook. IOS is for the simple minded who know nothing beyond the basics. (Oh no.... Variety is so scaaaaaaary) such a pity. So there are no new leaks? I have the V30 & S9+. I have to say the V30 is a great device, my only complaint is the power button on the back. The G7 put the power button on the side, I hope the V40 follows suit. It might be overkill but a tele, wide, and standard lens set up on the V40 would cover all the bases and make it one of the most flexible camera setups on a smartphone. Either way for me all LG needs to do is focus on camera improvements(bigger sensor and rival matching OIS+EIS stabilization for videos) and include at least a 3,500mAh battery for me. The V30 was already a great phone and LG finally fixed the front facing camera fiasco on the G7 so no need to revert back going forward. throwing anything on the wall and seeing what sticks. Hopefully they have a new (larger) sensor on this phone and a software update that will not take ages to implement. I would buy this phone instantly if they had not made it the size (or actually slightly bigger than the Note). Adding a half inch to the height of the v30/35 is just too tall. :( major disappointment for me. I'm hoping the price is lower than $900 or else I may have to opt for the G7.